There can be nothing more frustrating than having to carry extra weight on your run. No matter where you carry your water- on your waist, on your shoulders, in your hand- nothing is comfortable. The problem is carrying water not an option-it is a must. No matter the weather, hydration greatly affects your endurance and stamina as you run so not carrying water is not an option. When a person is dehydrated, your heart needs to work double time to try and cool down your heated muscles. For this reason, figuring out how to carry water while running is essential. No matter how unconventional the following tips may sound, they are the latest ways to keep you hydrated when you run. How to Carry water While Running ? How far will I be running ? ​How much fluid will I need ? ​What kind of run am I planning- short, trail, etc. ? ​How can I ensure my ultimate comfort ? It is good to keep in mind that we all have different preferences when it comes to our comfort. For some, having to carry around a backpack is not something they can run with while others are OK. Some want their hands to be free while others don’t mind carrying around something. Always tailor your choice to what makes you comfortable. Another thing to consider when you make your choice is the size. Not only should it be manageable but it also should allow you to carry enough. “Enough” being ideal for the kind of run you are going to do. You want to make sure that you don’t carry something that is too heavy. Look for a design that is just right. There are different options available that you can choose from. We will discuss nine of the most popular. This fits around the waist and is designed to keep your bottle close, so it doesn’t move around while you run. It also usually comes with additional pockets where you can store other valuables like a phone or keys. One of the disadvantages of this option is that you will have to reach around your back to get water which isn’t that convenient. This bottle fits nicely into your hand and has a curved design so that you are comfortable when you hold it. Many also have a pocket that can be used to store keys. On the down side, if you are running a long distance, you wouldn’t want to have weights on your hands. Many runners find this to be the most comfortable way to carry their water while running. The backpack is shaped like a camel’s hump and serves for the same purpose. Carrying weight on your back instead of other parts of your body. In addition, the backpack allows you to carry more stuff you might need. On the negative side, it won’t be easy to wash your backpack. Running usually helps runners develop strong legs and there is another way these muscles can be used-to carry water. This is a good option for people who want to keep their upper bodies free from any weights. For people who want their legs free, carrying around water on their hips is not comfortable at all. This is a vest with pockets on both sides that allows you to carry water conveniently. The harness goes around your back and makes sure everything stays in place. The bottle are close to your hands, so you have easy access to them. This is a belt that fits around the hips and can fit up to four little bottles. This allows for even distribution of weight around your hips and keeps your hands free as you run. Obviously this is only something available for lady runners. The bra is made with a handy pocket in between the cups and on the side that allows you to store items including water if you like. The water will be very close to your mouth making it handy. This is something like the pocket bra, but the difference is that with the water bra, the entire bra is filled with water. In addition, a flexible straw runs along the side making its way into your mouth. For small chested girls, this is a unique way to get a bigger bust. Another invention for women runners, this is a bra that comes with a mesh pocket on the back where a bottle can fit in. It is ideal for runners who prefer to run with a bra. No matter which option you feel is best for you, there are some things all runners need to remember in order to stay hydrated throughout the run. For long races or runs (more than 10 miles) you need to keep yourself well hydrated for few days before your run. Drink lots of water and stay away from alcoholic beverages. Make sure you get enough sleep. Running when you are facing a hangover makes you dehydrated faster. About an hour before you run, drink 16 ounces of water. Limit the amount you drink so that you don’t have to pee during your run. During your run, only pull out your water when you are thirsty. Drink an estimated 4-6 ounces every twenty minutes. For longer runs, you will need to carry a sports drink to replace the electrolytes lost. 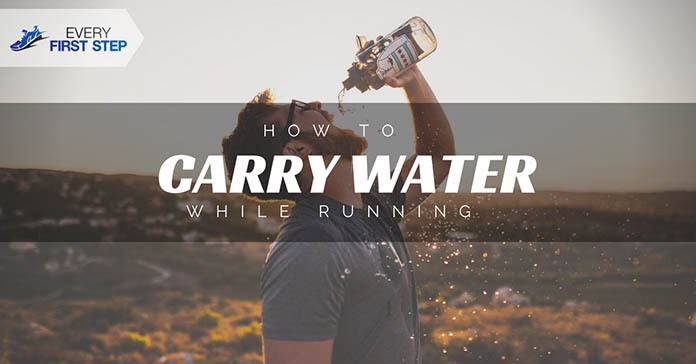 There is no one rule for all when it comes to finding the best way to carry water when running. The important thing to remember is your personal comfort and needs. While you should not carry too much water, be careful not to carry too little. Find the right balance,so you keep hydrated. Take into consideration the duration of your run, the amount you sweat and how much water you need. We want you to maintain the highest performance when you run and collected the mentioned nine options. Did you find the article helpful? What is your favorite way to carry water while running? Did we miss anything out? We’d love to hear your thoughts in the comments below.